Game of Thrones Season 4: A great show gets greater. 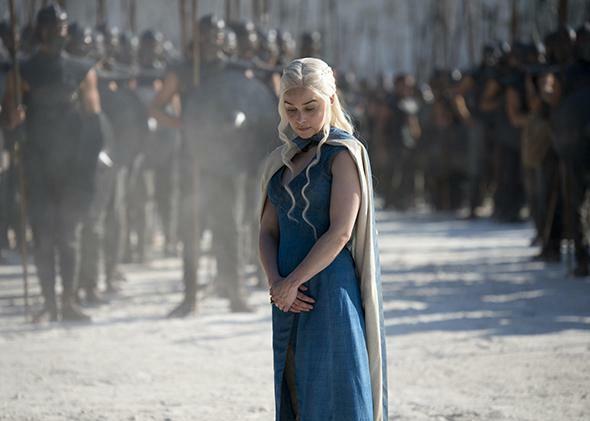 Daenerys Targaryen played by Emilia Clarke in Game of Thrones. The world of Game of Thrones is an immense one, and in terms of sheer narrative scope the show’s only rival is The Wire itself. But while The Wire built vertically, with each season focusing on a new cross-section of Baltimore, Game of Thrones expands horizontally, characters and locations drifting in and out and entire strands of plots left alone multiple episodes at a time. For a show with such a reputedly sadistic relationship with its viewers’ emotions, Game of Thrones has an extraordinary reverence for our attention span: One of the reasons the show’s traumas are so effective is that they’re so patiently crafted.